Would you believe that you are looking at a house? 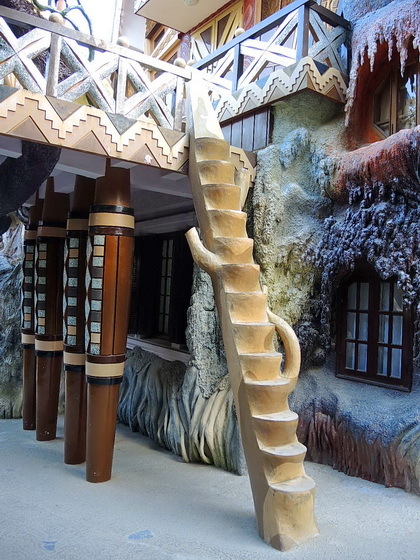 Yes, you are – the Crazy House in Dalat, Vietnam. 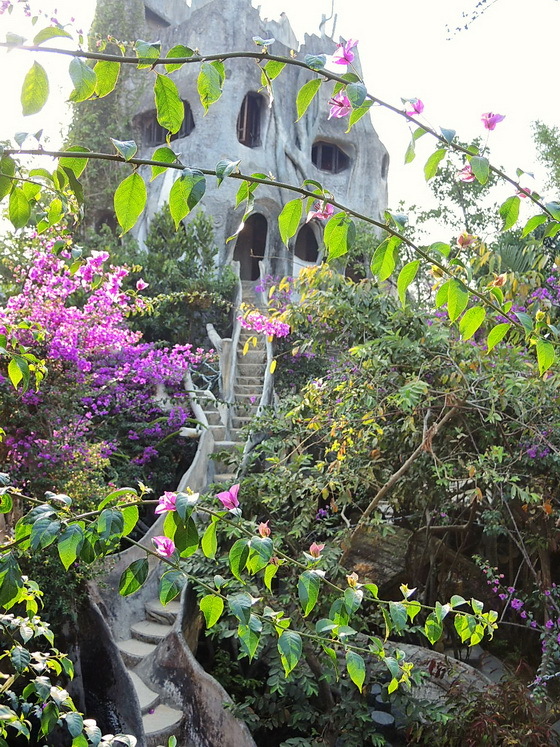 I went to the Crazy House today here in the city of Dalat in Vietnam. No, not to the loony bin – I did not go crazy. The truth is that there are no crazy people in the Crazy House at all. 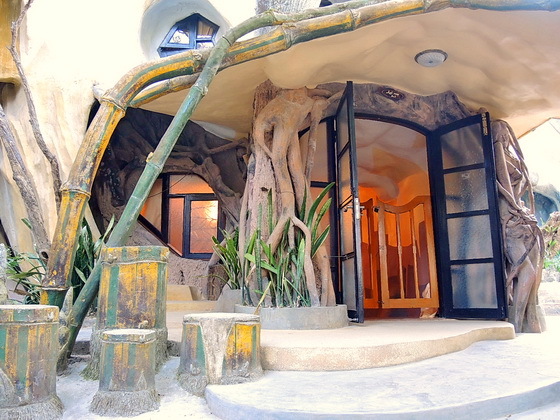 But there are plenty of tourists who are happy to pay the entrance fee to see this really unique house. Actually it is several houses, not one. It was built by a Vietnamese architect who wanted to break free from the traditional model of building, namely mostly straight lines and right angles and flat surfaces. So she let her creativity run wild and came up with a way of building which hardly uses anything straight, flat, or rectangular at all. All the buildings look like they are inside of gigantic trees. It is part natural architecture, part fantasy, and part total freedom of expression without any restrictive rules. If you don’t look closely, you can’t even tell that these structures are buildings. You might think that you landed in a jungle full of trees and vines and surreal buildings which might fit well in a Lord Of The Rings movie or another fairy tale. There are stair cases going everywhere in all directions like in a labyrinth. For example in order to get to the other side of a building, you might have to go over the roof instead of through it. To get to the other side of this house, you have to cross over the roof. There are (some) handrails, however they resemble tree branches and vines more than what you might consider a handrail. If you have any fear of heights, some of those staircases will scare the living daylight out of you. Let me tell you, they are not for the faint hearted. Some of them have very low handrails, while you are 10 meters or more above the ground. You better have good balance and no vertigo. Aside from that it is an amazing experience to walk over a building, through it, around it or from one to the other. Construction started in 1990 and is continuing to this very day (March 2014 as of this writing). I was told that it will take at least another 7 years to complete it – if it will ever be completed. 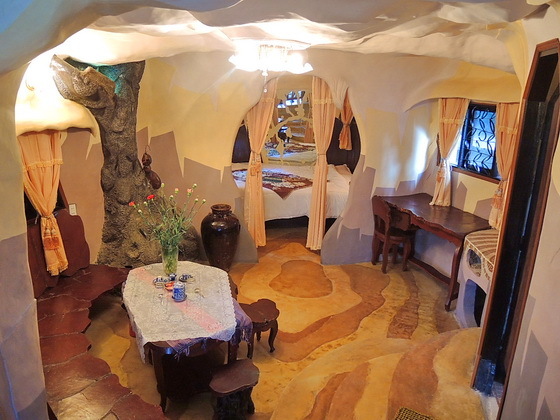 The Crazy House has a number of rooms or suites which can be rented for quite a reasonable price – between US $35 and $70 per night. The rooms are as bizarre and unusual as everything else. However they are all full of character and charm and I can guarantee you that you have never stayed in anything like it. I am planning to stay in the honeymoon suite with my wife when we will both be in Vietnam. The rooms are decorated in natural colors without any straight lines. They have a rustic and romantic feel to them – perfect for a honeymoon. Since I live in Thailand, it is just a short airplane ride to Vietnam, so our second honeymoon in the Crazy House won’t break the bank. The owner/architect lives in one of the crazy houses on the property. She is funding the ongoing construction from the entrance fees and the hotel business. 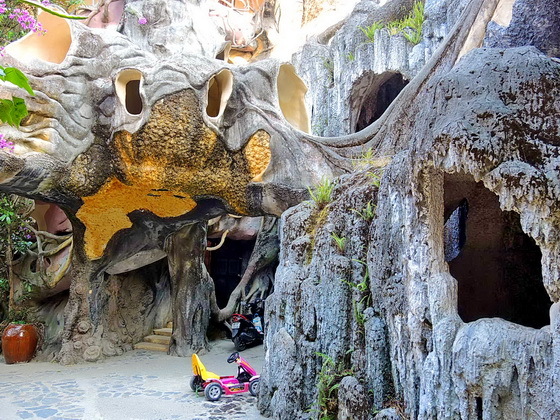 The Crazy House is one of the major attractions in Dalat and draws lots of tourists every day. It will definitely change your mind about what architecture is all about. Frank Lloyd Wright, the famous American free spirited architect, doesn’t even come close to the sheer creative genius of this Vietnamese architect. But then again, unlike Frank Lloyd Wright, she doesn’t have to sell her creations or please anyone with them. 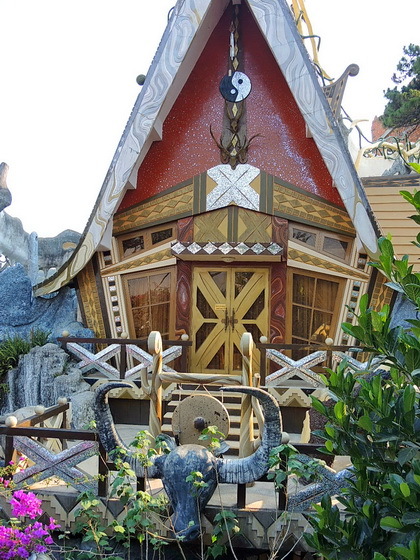 Although she seems to please thousands of tourists very well who happily pay the fee to see her Crazy House. It is one of those experiences where all your concepts of what houses should look like are turned upside down, where fantasy becomes reality, and where technology seamlessly blends with nature instead of crowding it out. It’s really a great concept, although most people wouldn’t be willing to wait a couple of decades for their house to be finished. Of course in this case the living space or the expense or the time frame was not the point. It is meant to be a creative masterpiece, the soaring spirit of free expression, and the passion to fulfill a dream – this is what makes Crazy House special and unique. 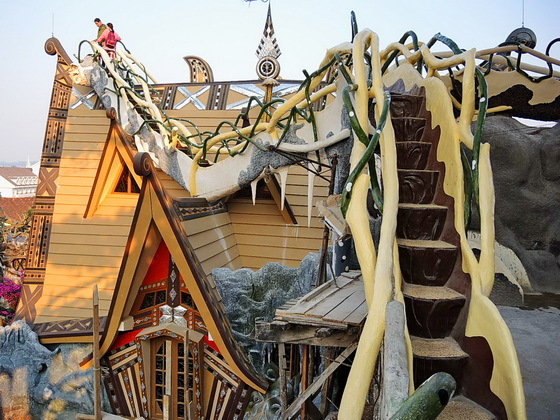 On a side note, the “Crazy House” in Dalat, Vietnam, is not the only such place in the world. I remember visiting a place near a village in Mexico, called Xilitla, which the locals called “El castillo del Ingles loco”. This translates to “The castle of the crazy Englishman”. You can read a traveler’s account of this place here. This place was even more surreal since it had features like a “staircase to heaven” which ended in mid-air, and rooms which shrank in height at the far end so that you could not even stand any more. Even the bathrooms are designed without straight lines. 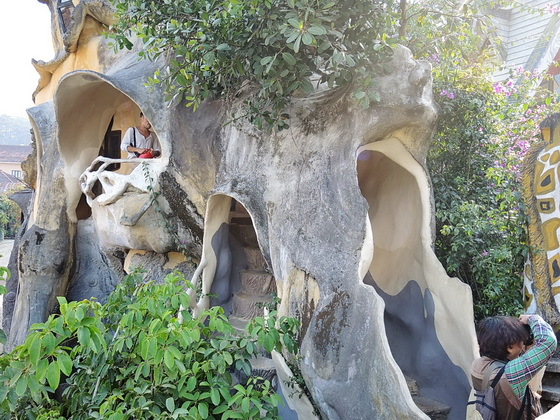 Compared to this place in Mexico, Dalat’s Crazy House might be also bizarre, but it is perfectly livable and comfortable. It is actually quite a romantic place to spend a night in some of the most unusual rooms you have ever seen. 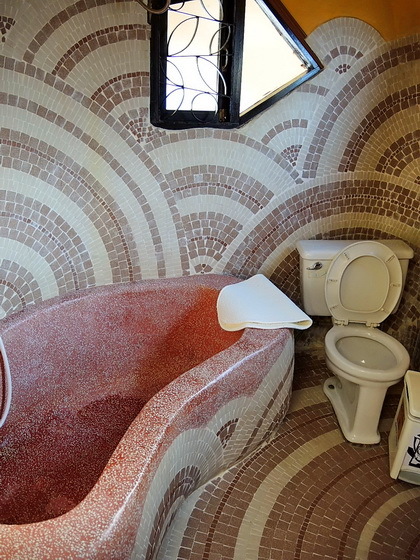 The architect managed to design almost everything without using any straight lines, and that includes the bathrooms. The “tree” concept pervades the architecture. 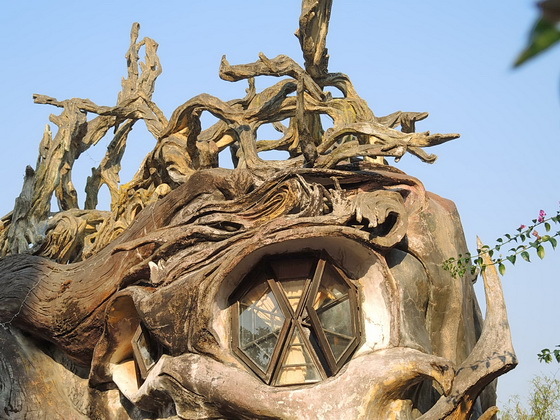 If you would view “Crazy House” from a distance, all you would see is jungle and trees. The author, Shama Kern, has been living and traveling in southeast Asia for well over a decade.